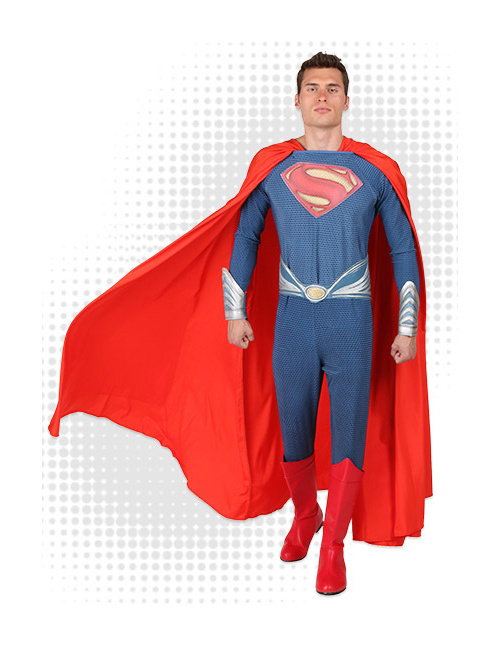 It's a bird, it's a plane, it's a whole catalog of Superman costumes! 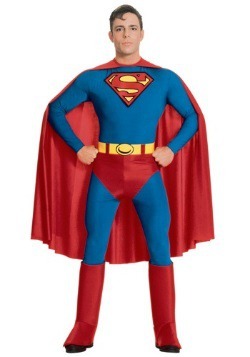 While other superheroes have all sorts of costumes, Superman's look is instantly recognizable no matter the decade. 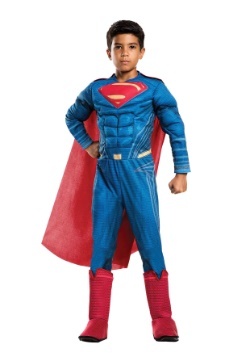 It's easy to find Superman costumes for boys, girls, women, and men. 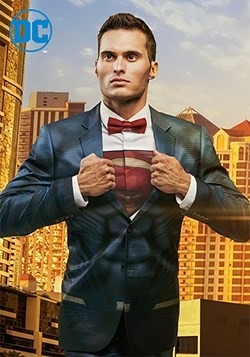 Whether you're looking for a Clark Kent suit or you're looking to slip into a muscled jumpsuit, you're sure to find the right look in this selection. 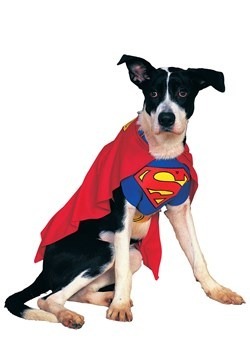 Flight, super-hearing, super-intelligence, vision powers (including x-ray vision) super-speed, super-strength, super-breath... do we need to go on? 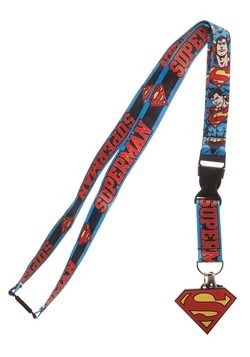 Superman's nick name The Man of Steel was obviously well earned. Except for having that one little vulnerability to green Kryponite he is pretty much indestructible. 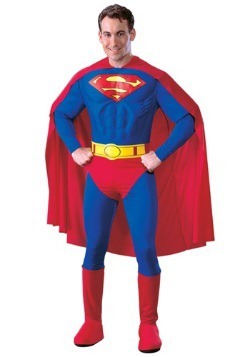 His uniform has become nearly as famous as Superman himself. 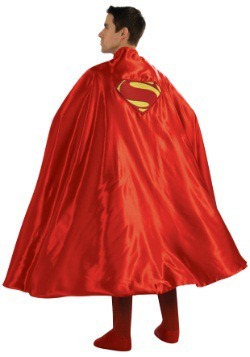 Consisting of a blue bodysuit emblazoned with a red and yellow 'S' on the front and topped off with a heroic looking red cape, this guy looks the part of the quintessential superhero. 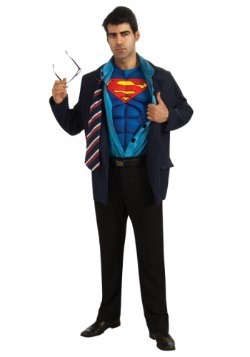 Plus, the sleek quality of his super suit fits easily under everyday office wear, as was demonstrated by Clark Kent, so he's ready at a moments notice to be Superman! 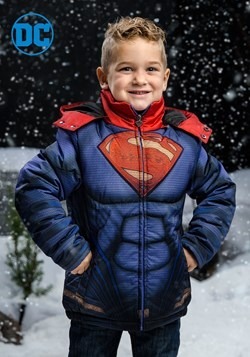 If you have always dreamed of stepping into a phone booth and tearing open your shirt to reveal a Superman costume we have some good news and bad news. 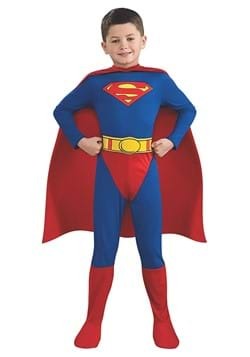 The good news is that we carry a great assortment of Superman costumes right here so getting the look down will be easy. 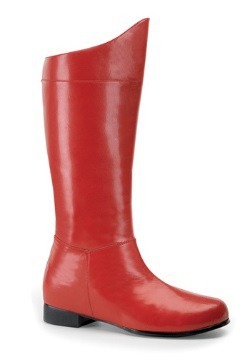 The bad news is that finding a phone booth is going to be a little tricky. Seriously, everyone carries cell phones now so you're going to be searching a while to find one. 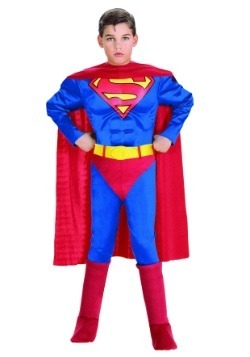 Superman's powers were what made him, well, super! 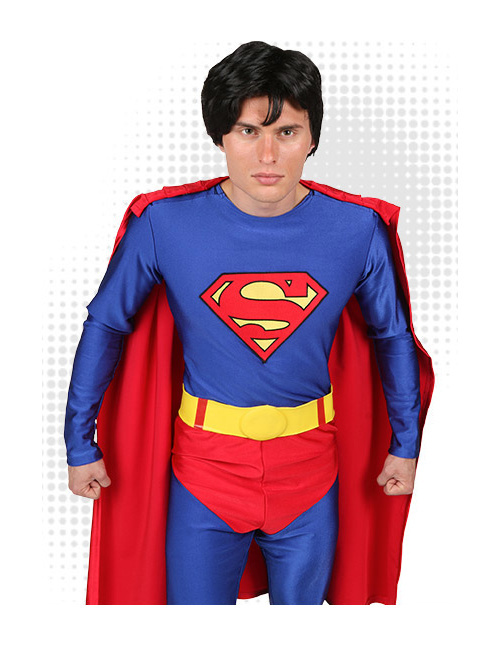 On his home planet of Krypton, he would have just been a regular Joe. 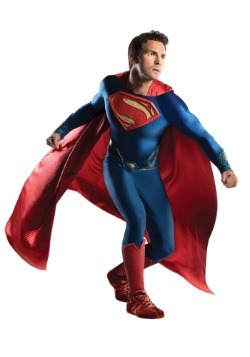 But here on Earth our yellow sun gave him the ability to be "Faster than a speeding bullet. More powerful than a locomotive. 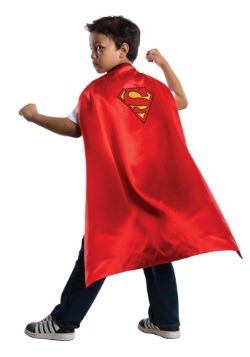 Able to leap tall buildings in a single bound..." And of course flight, invulnerability, super-speed, super-vision, super-hearing, super-intelligence, super-breath... the list goes on and on. That's a pretty exhaustive array of powers but we've come up with some ideas to let you convey your ability while in costume. Read carefully, practice, and employ these techniques. 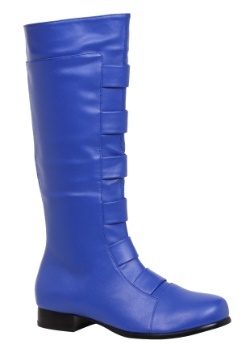 People will be in awe of your super style! 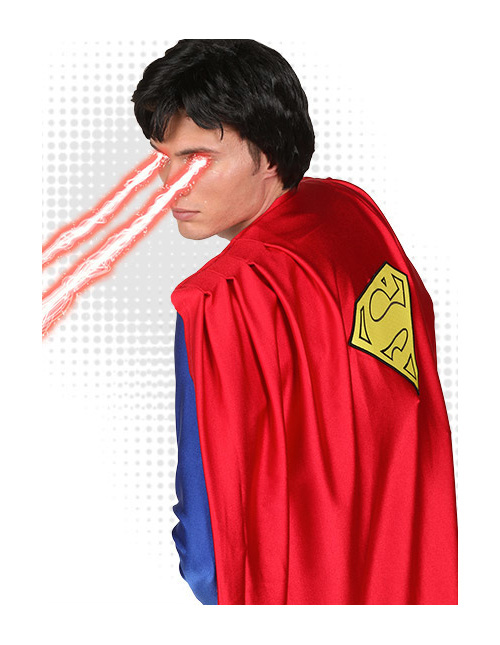 Superman was well known for his superpowers and one of his most famous was his heat vision. 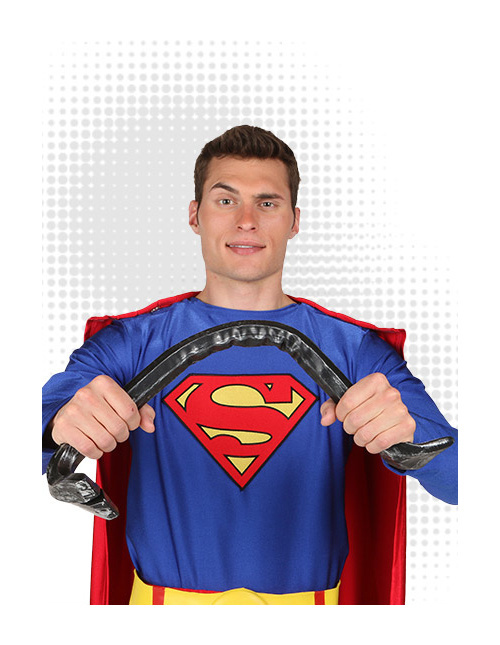 He can cut through metal, fry bad guys, and spot weld broken machinery. 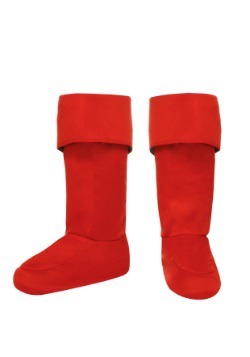 You can practice your heat vision pose by staring intensely at a fixed point! 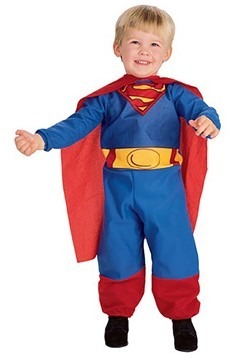 As a non-kryptonite it's going to be hard to replicate Superman's super speed. You can, however, practice your starting stance. 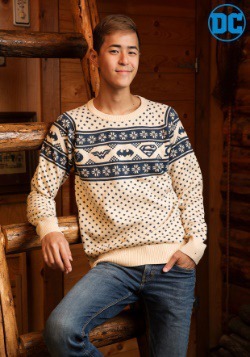 Hold your arms steady at your side like you are about to take off running after a nefarious thief. All of your fans will be so impressed they'll forget that you're not the real deal! 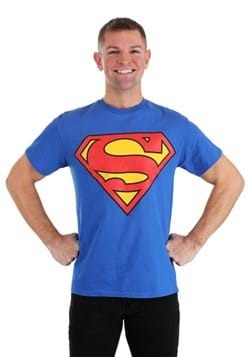 One of Superman's greatest traits was his super-strength. He was of course able to perform amazing feats that no human could replicate. 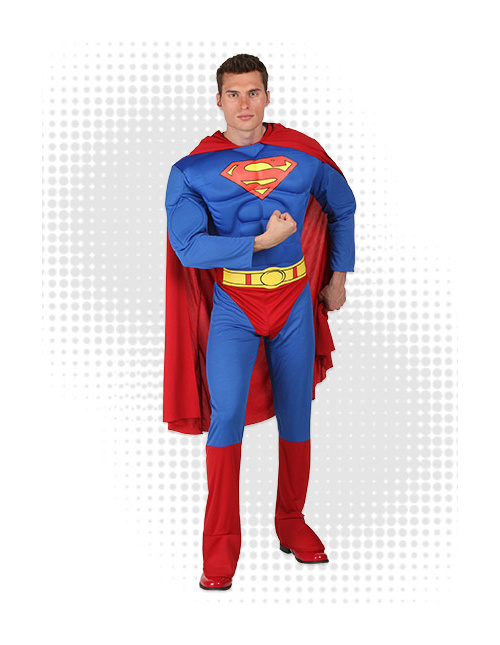 You can augment your costume by taking stoic stances. 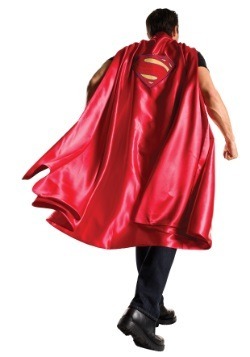 Flexing your muscles will assure everyone of your Superman authenticity. Even if your physique is not particularly muscular you can still practice these stances for dramatic effect! 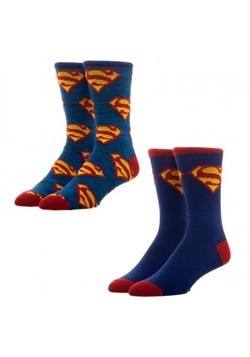 Superman of course used the power of flight to fight his foes and traverse great distances. 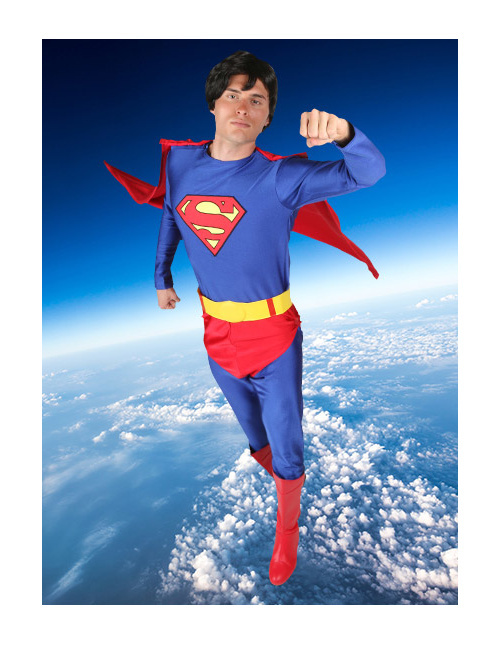 While donning a Superman Costume won't give you the power of flight, you can practice your up, up, and away pose. Just put one fist in the sky, one at your side, and utter the iconic phrase! 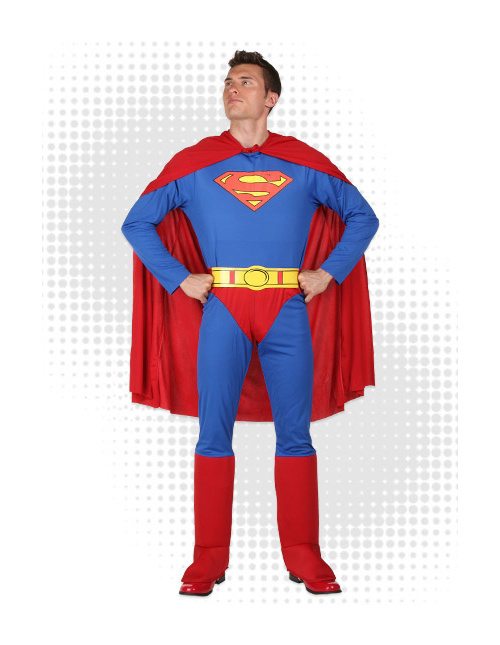 If you're ready to take your turn as Superman, you're going to want to make sure that you have the right costume to fulfill your super ambitions. 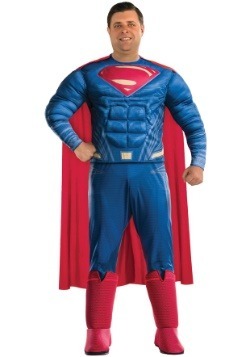 Luckily we have assembled the world's greatest selection of Superman costumes and gear! 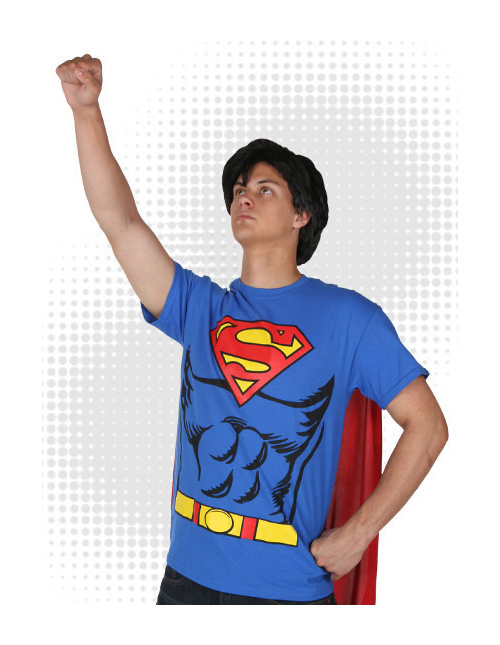 We've got costumes from basic to collector's quality, and with fun t-shirts and accessories, theres no limit to how high you can soar in these super duds. These are some of our top picks to showcase the different options, from simple to high end, and at a price that fits your budget! 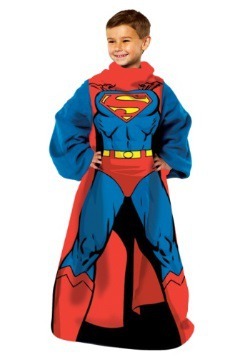 If you're into the T-Shirt idea but want to up your game just a little bit, this shirt and cape combo is a great option. 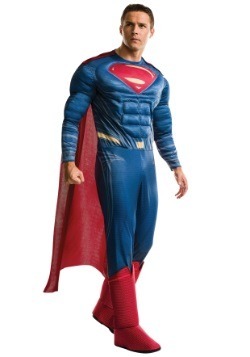 It has printed muscle effects so even if you're less than muscular you can feel super. 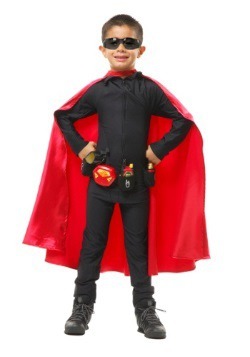 Plus the cape attaches with Velcro and removes easily so it's also the perfect addition to your everyday wardrobe. The stoic look of muscles make can make even the simplest guy feel like a true hero. Even if they are polyfoam inserts! This great costume will have damsels in distress swooning, and will make you the star of the party! 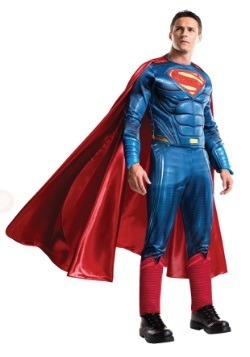 2012 finally produced the long awaited reboot of Superman with Man of Steel. 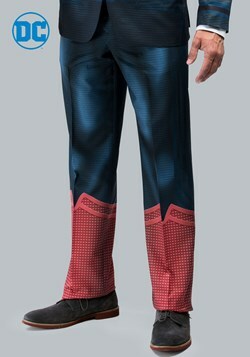 The film also rebooted his look with a modern update to the classic look. 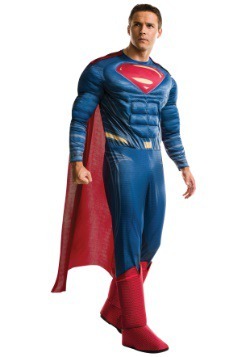 If you're a fan of the film, this costume is the perfect way to show off that you are ready to take Superman into a new era! 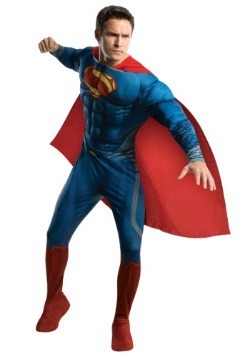 Any of our cool Superman costumes are stand-alone hits, but if you want to go above and beyond (or up, up and away!) 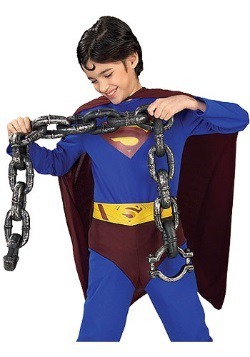 you'll want to accessorize your costume with some top notch Man of Steel accessories. 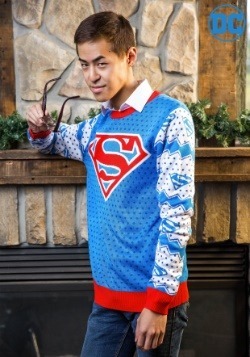 Luckily we've got the props and accessories that both complement your super-attire and let you bring a little Superman into your everyday life! 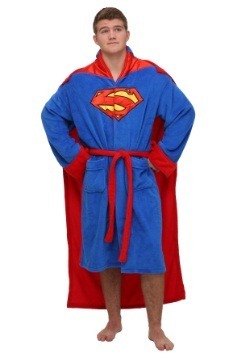 Superman was renowned for his super strength. If you're worried about having to prove your might to your friends, this bendable bar is an easy addition to your getup. Simply take it out at the party and watch as everyone is amazed at your ability! 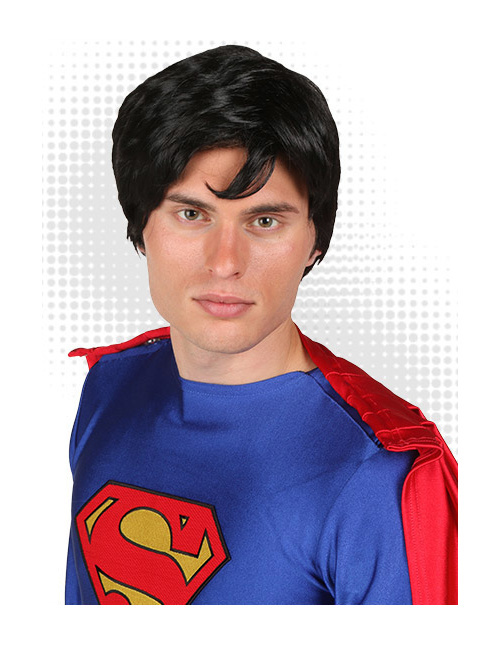 Maintaining a full head of Superman caliber hair can be a tough task for some guys. (Especially if you're a blonde!) 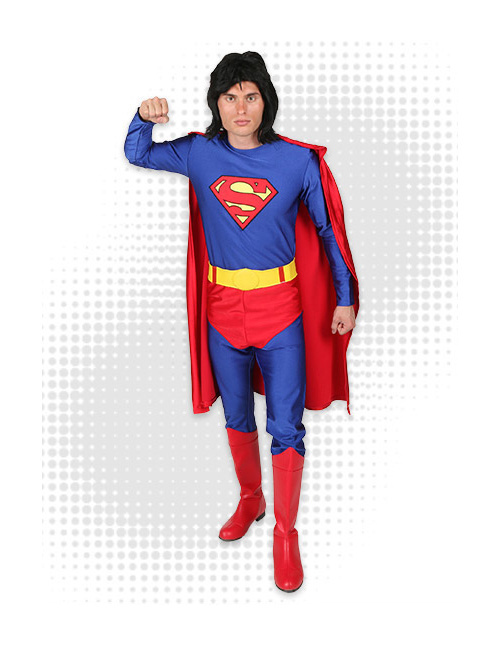 Luckily a black wig can be appropriated to make you truly look like the Man of Steel! 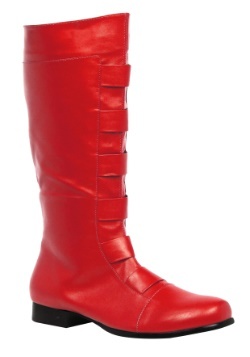 Sometimes costumes are a little bit lacking in the footwear department. And you don't know when you might be called into action! 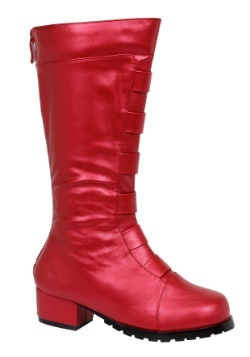 Upgrade your costume with superhero caliber boots that will both look great and serve you well if you have to battle villains! 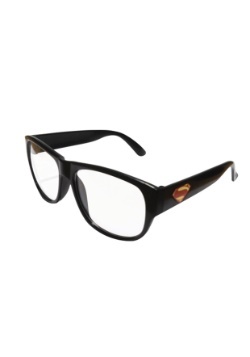 A lot of people are still befuddled at how Clark Kent got by for so long without being recognized as Superman but we totally get it... it's the glasses!! 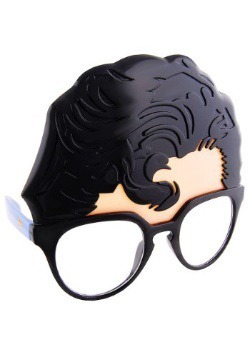 While it might be a stretch of the imagination in the real world, those black rimmed glasses were all it took to keep his identity safe. 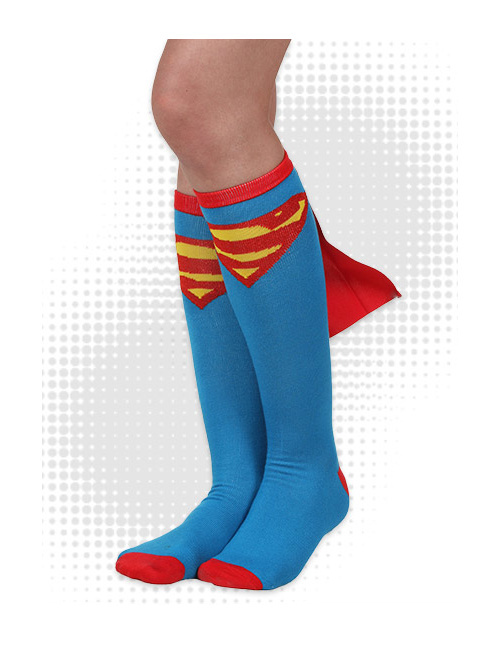 Superman socks might be the best way to let everyone know which Superhero you have on the mind. 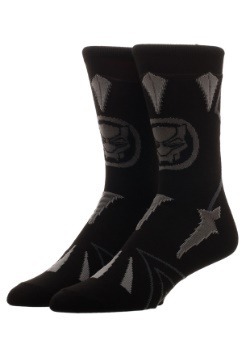 Wear them with a costume or without, the capes fluttering in the wind will inspire others as you speed by! 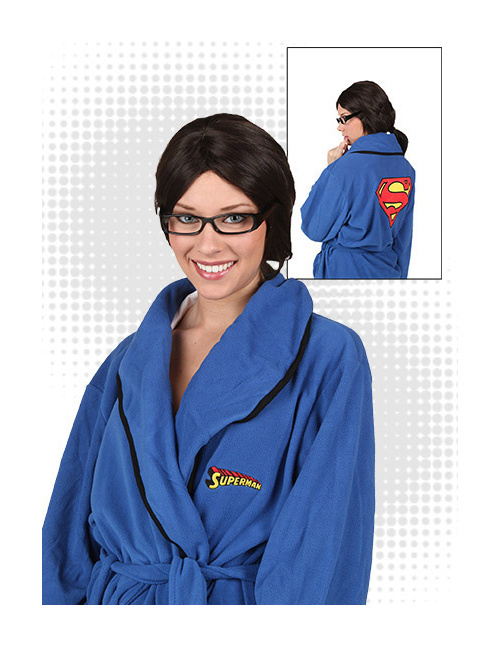 Lois Lane knows that the most comfortable attire to wear around the house is her favorite Superman robe! 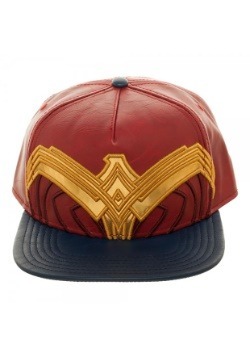 Since it has the Superman shield on the back she'll be able to revel in her favorite hero all day and night. 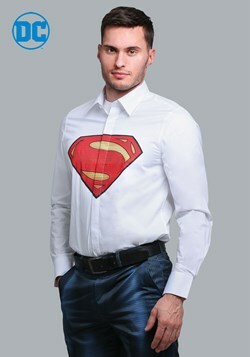 A Superman costume is great for any situation, any event, any circumstance. 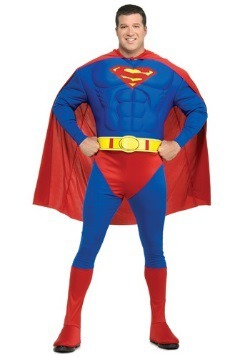 But sometimes Superman is better off with a partner! 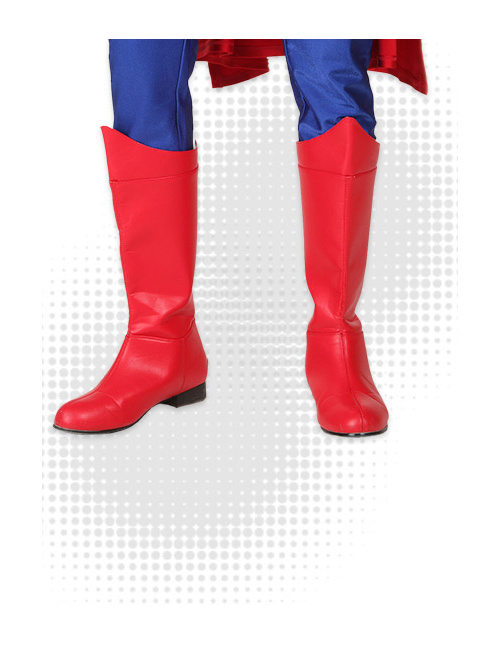 There are three main women that crossed paths with Superman from time to time, so any of these pairings would make for a great couples costume. Of course these are only suggestions and you're free to let your super-imagination run wild. When you have the S shield on your chest, no one is going to second guess your decisions! 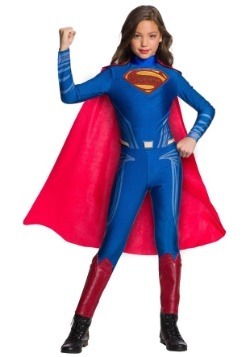 Supergirl first appeared in 1959. 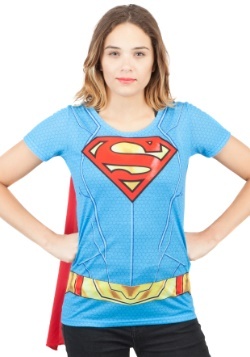 As the last survivor of Argo city she was sent to Earth to be raised by her cousin Superman. 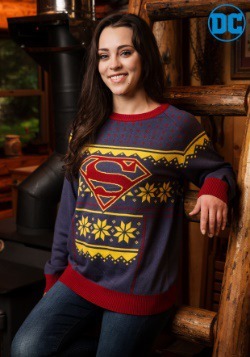 It took her awhile to get used to her powers on Earth, but in short order she earned the mantle of Supergirl and was out saving the day with Superman. 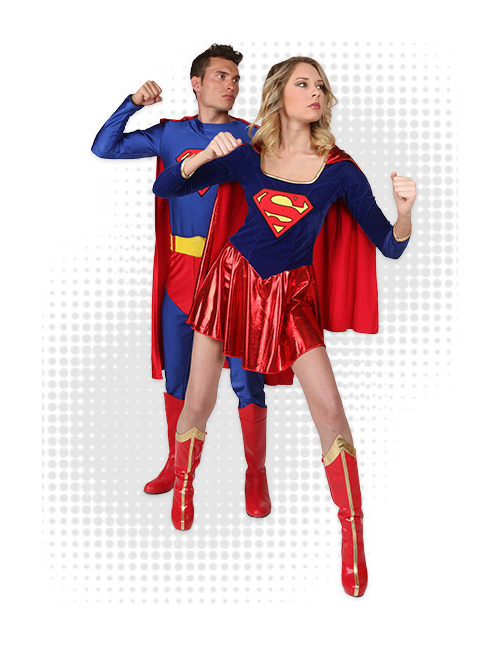 This is the perfect costume combo for a guy and girl who share a platonic connection! 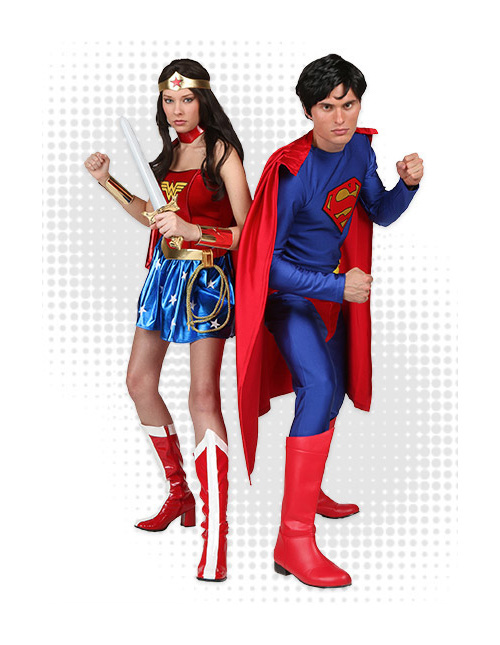 When Superman paired up with Wonder Woman, they would become the ultimate crime fighting team. Their powers complemented each other perfectly, and while they are officially just "really good friends" they have been known to lock lips once in a while. 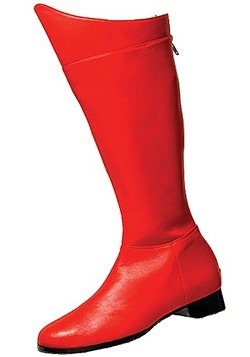 This makes a great costume for the on again/off-again couple or for any pair with superhero ambitions! 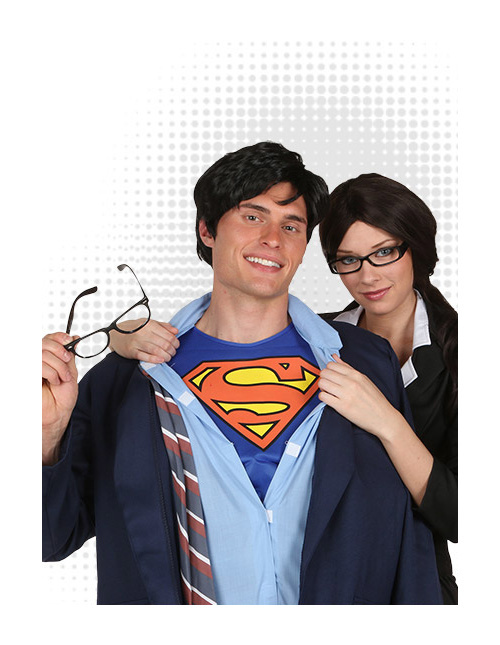 One of the most classic couple combinations of all time is Lois Lane and Clark Kent. The couple had their ups and downs but for the most part their romance has stood the test of time. 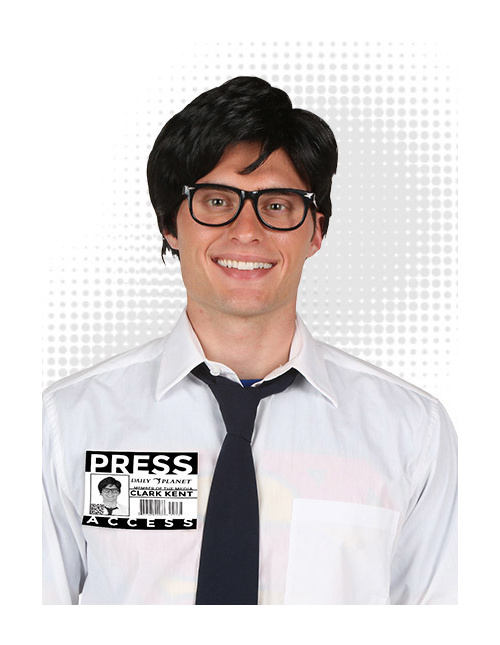 There's a variety of looks that work for both Clark and Lois but our removable shirt Superman Clark Kent costume will let you set up those iconic moments with Lois! 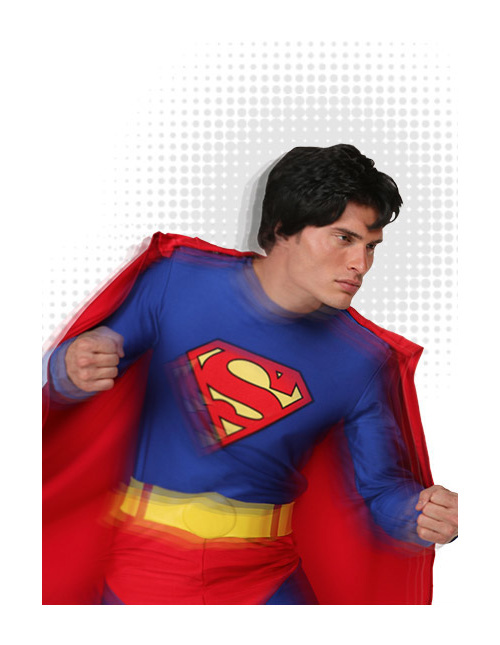 When you take off the glasses and done the classic uniform with the shield you can rescue Lois from all kinds of danger. Like punks at the costume party! 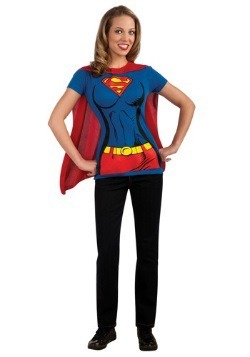 You might not be able to fly her away from peril, but hopefully you can take her home in your car! We love it when people are inspired to get creative with our costumes. 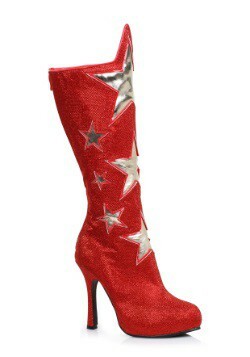 Customizing or adding the right accessory can take any costume from run of the mill to award winning. The only limit is your imagination! 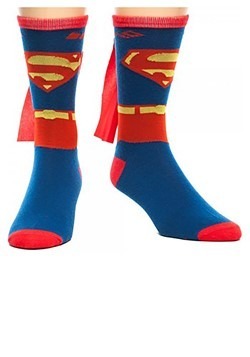 Here our some of our favorite ideas by our in-house Superman fan club. 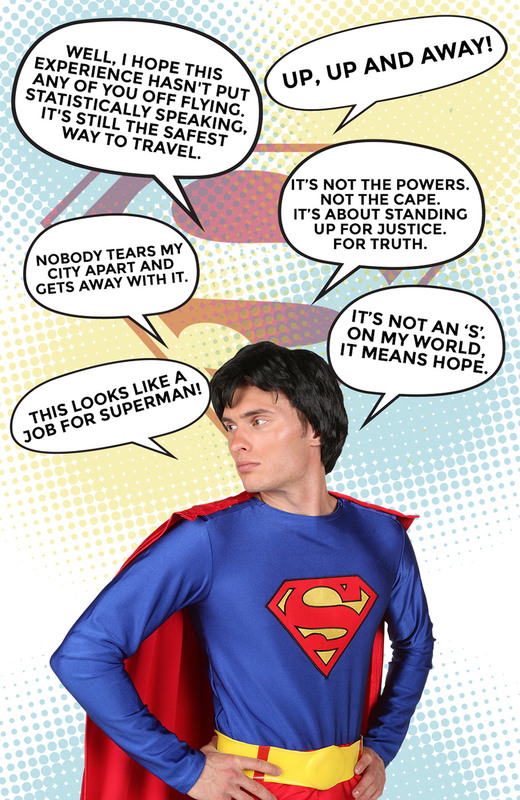 You can take one of these ideas and run with it, or use the inspiration to create your own alternative Superman! 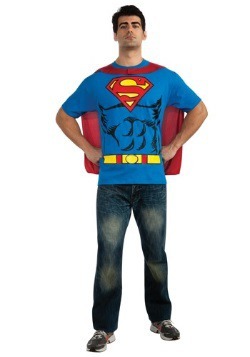 In 2011, Action Comics was rebooted with Superman rocking the easy going look of a T-Shirt with Jeans. 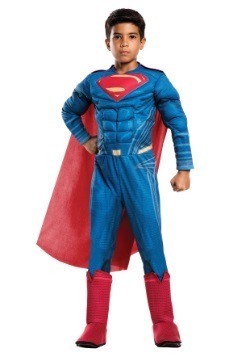 Fortunately they kept the cape so he still looked like the Man of Steel. 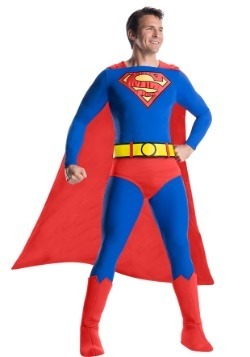 This is an easy DIY look for a Superman Costume! 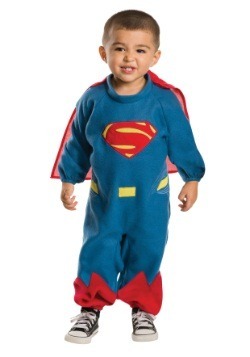 Even Superman had his mullet phase, and true fans will appreciate your attempt to mimic this little known look. 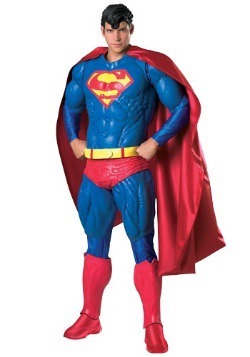 You can add a fun wig or accessories to imagine the Man of Steel any way you like! 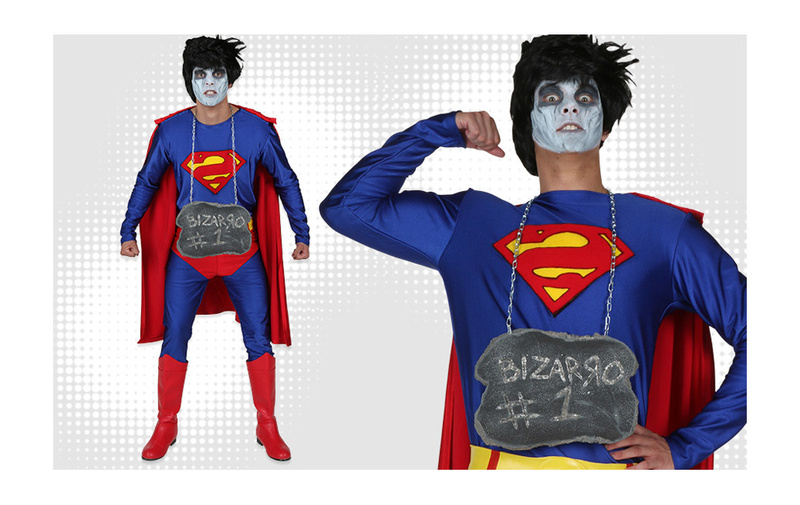 Maybe you want to be a bad guy with a little bit of Superman flavor...Bizarro would be the perfect choice! 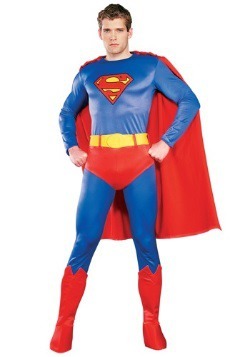 Created by a duplicating ray, his chalky white skin and erratic behaivor make him the antithesis of Superman. 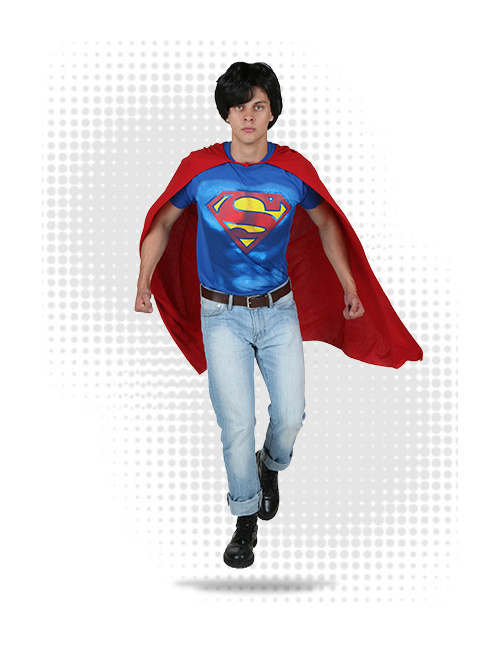 Portrayed in many different ways over the years, a few simple DIY add ons to our Superman Costume will let you be the weird villain!